GFS E&C provides expert and quality pipeline and facility construction, pipeline integrity, coating and wrapping applications, custom fabrication support to EPC contractors. 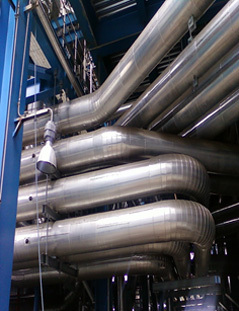 Interplant Piping is one of the most important aspects of plant and process engineering. GFS E&C carries out Piping Layout, Preparation of Piping Drawings, Preparation of Piping Assemblies, Pipe Routing, Pipe& Equipment layouts, and finally Fabrication, Erection, Testing and Commissioning of interplant piping for the Oil & Gas Onshore, Power, Fertilizer, and Petrochemical Plants. GFS E&C does Engineering work on Utilities, Jacketed Piping construction in materials like Carbon Steel, Alloy Steel, and Stainless Steel. Our welding teams are capable of delivering high quality welds on MS, CS, AS, SS, GRP, FRP, and HDPE piping materials according to required client specifications. GFS E&C along with globally renowned expert partner is well positioned to carry out in-field or in-plant Hot Tapping & Line Intervention projects of any nature. Contracted workshops and in some geographies our own fabrication shops are equipped with cutting, bending, welding, testing, blasting, and coating shops to perform required works. Contact GFS Engineering & Construction for all your interplant piping needs.